It is not always easy to wait. Its like being a kid when your birthday is coming and you know you are going to get presents and you just can not wait to find out what they are. Or maybe, its like being an adult going through a time where you know the Lord has a plan and you are doing everything you know to do but the light at the end of the tunnel seems to still be far away. It can be hard to wait. 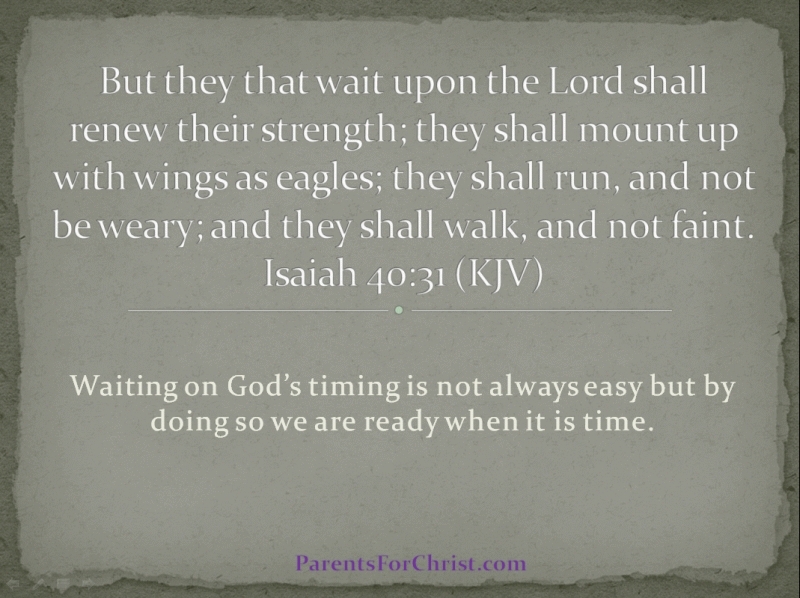 Take to heart the promise given to us in Isaiah 40:31, "They that wait upon the Lord shall renew their strength; they shall mount up with wings as eagles; they shall run and not be weary; and they shall walk and not faint." Wow! what a promise. With a promise like that, it is worth waiting on God's timing. 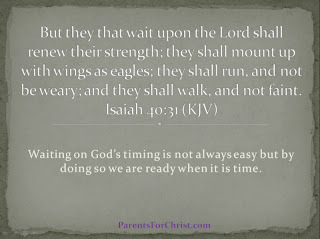 I know when I do not wait on God I feel run down and wore out. And let me tell you, it is hard to be mom when you are wore out. I do not know the trials that you are going through, but I do know that God is always faithful. Get up and do what is required of you and He will meet you.